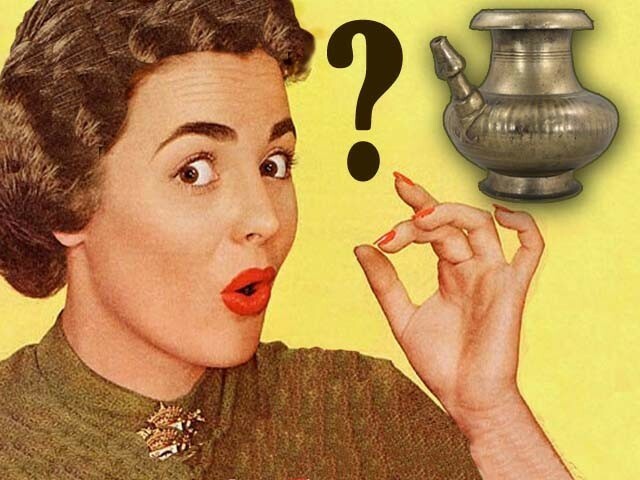 Americans and Brits are especially fascinated by the lota. We miss many things when we’re living away from home – mangoes, bun kebabs, paan, the dust, the loadshedding. Okay, okay, just kidding! We miss some of these things, but we manage without them, one way or another. There you go. Beautiful? Yes, he was talking about the brass lota that the village women clean and polish with tamarind and ash each day, turning the ‘brass into gold’. They are beautiful… and very heavy. Most people flying out struggle with weight restrictions, so carrying a heavy brass lota in your luggage is an extravagance when there are achaars (pickles), chilli chips and bottles of Mushroob-e-Mashriq sherbet fighting for space in a suitcase. The ubiquitous, elemental, and exceedingly essential lota loses out in the process. You will not see brass lotas much outside Pakistan. Instead, you’ll see ugly plastic ones which replaced the bronze ones in Pakistan a while ago in any case. So what do you do once you’ve reached your particular pardes and you have no lota in the new house? You reach for the nearest milk bottle, of course. You’ll find all sorts of milk bottles in people’s bathrooms out there – full cream, low fat, skim, soya, chocolate, vanilla, or my favourite, strawberry. People are strangely coy about them. “Why’s there always a milk bottle in your bathroom?” visitors have asked – always American. In England I caught a native looking bemusedly at my strawberry soya milk bottle (organic) before she shut the door to the powder room, and I waited with an array of answers provided by errant nephews (one of whom claimed to possess a folding lota that fit in his wallet, but it turned out to be only a zip lock bag) for just this purpose. 1) I use it all the time to irrigate my nose. I have a deviated septum. 2) I prefer strawberry soya, so I removed the chocolate you saw when you were last here; sorry. 3) Would you prefer the chocolate? I can put that back if you like. 4) It’s a Pakistani superstition. 5) In Pakistan we like to keep our cows in the bathroom, but we can’t do that here, and the milk bottle reminds the kids of that tradition. Oh, why the fuss! Bring the lotas out of the closet. Let Ikea carry dismantle-able ones in their standard flat colours, and back here in Pakistan, how about Haji Karim Baksh carrying a line of lota gifts for relatives in the West? ‘Loin of the Punjab!’ (sic) proclaims a T-shirt in one of the shops in Lahore, alongside a gun-toting portrait of Sultan Rahi. The lotas could carry just that slogan, no Sultan Rahi required at all. LOL …I can identify completely with this article ! When is Ikea going to bring out the contemporary version of the lota ! When we go on holidays to Europe, the 1st thing we pack is a couple of empty..NOT.. milk bottles but empty plastic drinking water bottles !! When my Romanian cleaner first started cleaning for us..and I had to explain the lota concept to her. She remarked ‘ Why don’t you have a bidet,like we have in Europe?’! In fact, I want one of those high tech toilets they have in Japan, where a jet of water washes you and then ehem dries you ! That would sound the death knell of the lota ! I had to google lota…I didn’t know what it meant. I had to google ‘lota’… didn’t know what it meant. My question is..what did they do before that- just ‘dry clean’ with toilet paper ? ………….and so you have a wacky funny side as well. How did you miss out on mentioning the ‘ muslim shower ‘ contraption that’s now, just about everywhere. In Seoul our hotel had a very efficient system built into the seat with 3 buttons to press and WALLA ! …….magic. Can you imagine the delight of the children on discovering this ?? I don’t believe I’m commenting on this and laughing my head of at the same time. 1- Lota… You wont find it in 99% of Pakistani households even in villages they use Muslim Shower. Please stop acting, you knew that, didn’t you? 2- I have used water bottels in hotels in Rome & London but residents can always get a muslim shower fitted, or as a minimum get plastic jusgs, and in london take a tube to southhall and you will find all types and colors of lotas including made in Gujranwala! 3- Do you have lotas in your parliament? for pooh or pee because no lotas are available in the offices. You must write more such stuff. I enjoyed this soo much that I was laughing when I commented and sure enough it went up in smoke………I’m sure I pressed the right button. In your deep, deep analysis you missed out on mentioning the creative gadget ‘ the muslim shower ‘ found just about everywhere now replacing the humble lota. When in Seoul the hotel had on its ‘seat’ three buttons you press and presto !…….magic. @ SKID MARK…seriously almost fell off my chair lol at your nick name with regards to this lota topic! Well, here in the West people have always used just dry toilet paper which I think is just unhygienic . You can now buy packets of moist toilet paper in supermarkets which we use when travelling. One can go to Walmart and ask for “Garden Watering Can”….its sibling of Lota…. AT LEAST SO MANY PEOPLE USE EVERY DAY A LOTA, WATERING POT, A SHOWER INVENTED FROM THE INNOVATIVE KOREANS OR JUMP IN THE POND(as I saw in villages and mountains of Pakistan). THE OTHER HALF OF UNHYGIENIC POPULATION ONE CAN JUST IGNORE! LOTA BY THE WAY IS TOTALLY INCONVENIENT AND UNSUITABLE FOR THE SMALL AND NARROW WC. ONE MUST RAISE THE WHOLE LEFT THIGH, BEND ON THE RIGHT AND IF ONE IS OVER-WEIGHT, NO FORGET THE LOTA IN EUROPE! BEST IS WATER PIPE! Commented twice both times my computer showed it was under moderation……….and then the comment vanished. I stand defeated by the bumble lota………I surrender. Originally the way a lotta was designed was that it did not have a flat bottom. Therefore when placed on the ground, it would not stay in one place. It would roll across according to centre of gravity. Political lots, role according to center of power. @Author. Nice light- hearted article. You said lots is a big part of Muslim and subcontinental culture I think the religious qualifier was unnecessary, this is common to all in the subcontinent. It is not common across all Muslims in the world. We have been living in United Kingdom for 40 years and we have always used a plastic Mug in our toilets. We take a plastic mug with us when we go on holidays and it is very convenient to use when you are staying in a hotel. @SoldierBazari: why agonise over explaining yourself in any way?! It’s how we do it, folks. @Truth: well many people do stock the the WalMart vessels. But you know, given its very long spout it tends to be a bit overenthusiastic and overshoots the mark very often. The lota is like a GPS, it gets there spot on every time. I think Maya was refering to E.coli infections..
A westerner who began to use water remarked ‘once you wash that crack,you can’t go back’. @Rabia: You’re so right, I forgot the villages and fields …………point well made. Whats the big deal – it is a hand held Bidet! No one uses a soap. it is too irritant. we only use water on its own. No tissues. In those areas where piped water is available. It is difficult to use in very cold weather. When it will give you ice cold water. A jug of water can have mixed hot and cold water providing warm water at the desired temperature. In Uk a hand shower can’t be used as the water is ice cold. A toilet seat has been advertised with a warm water spray included in the seat. As all new inventions are expensive it will take many years to become common. One litter mug is used by a majority of Asian people to wash in the toilet. Lota is a term used for Politicians who change their mind frequently. Many Pakistani politicians are Lotas, but now we can include Barak Obama in this category. Instead of finding out who used the chemical weapons in Syria. They have sent a very high powered UN team to confirm that chemical weapons have been used. They argue that If these are confirmed as chemical weapons then it must be Asad who used them. I wish they are standing in front a court of Law when they say this. The Judge will through their argument out in no time.